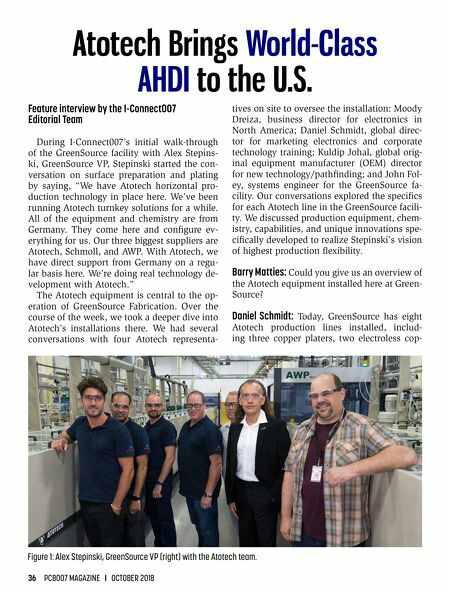 36 PCB007 MAGAZINE I OCTOBER 2018 Feature interview by the I-Connect007 Editorial Team During I-Connect007's initial walk-through of the GreenSource facility with Alex Stepins- ki, GreenSource VP, Stepinski started the con- versation on surface preparation and plating by saying, "We have Atotech horizontal pro- duction technology in place here. 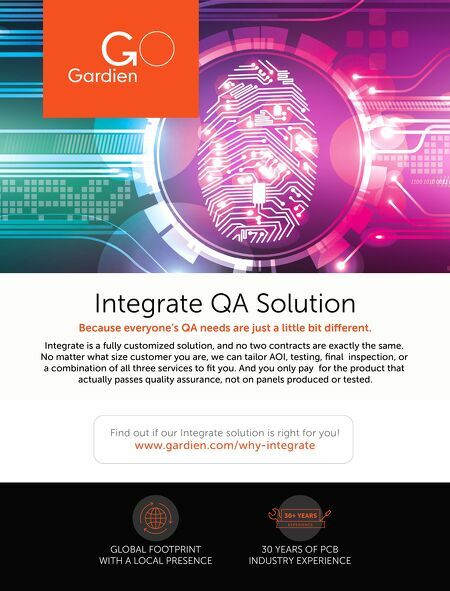 We've been running Atotech turnkey solutions for a while. All of the equipment and chemistry are from Germany. They come here and configure ev- erything for us. Our three biggest suppliers are Atotech, Schmoll, and AWP. With Atotech, we have direct support from Germany on a regu- lar basis here. We're doing real technology de- velopment with Atotech." The Atotech equipment is central to the op- eration of GreenSource Fabrication. Over the course of the week, we took a deeper dive into Atotech's installations there. We had several conversations with four Atotech representa- tives on site to oversee the installation: Moody Dreiza, business director for electronics in North America; Daniel Schmidt, global direc- tor for marketing electronics and corporate technology training; Kuldip Johal, global orig- inal equipment manufacturer (OEM) director for new technology/pathfinding; and John Fol- ey, systems engineer for the GreenSource fa- cility. Our conversations explored the specifics for each Atotech line in the GreenSource facili- ty. We discussed production equipment, chem- istry, capabilities, and unique innovations spe- cifically developed to realize Stepinski's vision of highest production flexibility. Barry Matties: Could you give us an overview of the Atotech equipment installed here at Green- Source? Daniel Schmidt: Today, GreenSource has eight Atotech production lines installed, includ- ing three copper platers, two electroless cop- Atotech Brings World-Class AHDI to the U.S. Figure 1: Alex Stepinski, GreenSource VP (right) with the Atotech team.